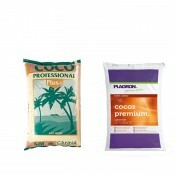 Growing in coco coir or a coco coir mix of pebble or perlite for your indoor growing of plants. 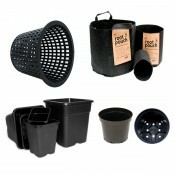 coco coir growing medium is extremely popular and adds many benefits to your indoor gardening needs. When you use coco as your grow medium, you are using a renewable source of medium in that the use of ground up coconut husks is eco-friendly and sustainable. By applying nutrients, such as Canna Coco A and B, and House and Garden Coco A and B will super charge your plants nutrient uptake and develop strong roots for proper feeding and increase potassium for greater growth. With Dutch Pro Hydro/Coco Bloom and Green Haze Bloom nutrients give your crops bold potency, greater flavour and higher quality and quantity crop yields. Use the proper sized pots such as our Atami Wilma square pots that come in tons of sizes along with our square flexible trays for all your gardening needs.